The Story of Job: An original treatment by Lester Clarke and David Wickes for a television ballet of Job: A Masque for Dancing by Ralph Vaughan Williams (from a treatment by Sir Geoffrey Keynes). Choreography by Robert Cohan. Produced for Thames Television (London) by Lester Clark and Anton Bowler. Directed by Anton Bowler. Performed by members of the London Philharmonic Orchestra (conducted by Vernon Handley) and by members of the London Contemporary Dance Theatre. The Story of Job is a visual marvel, and creates some interesting puzzles for a reviewer with loyalties both to broadcast media and to Blake which I shall discuss in turn. Perhaps the most impressive aspect of the production is the full and imaginative use it makes of television as a medium for the creation as well as the transmission of art. This is a virtue worth emphasizing (in particular since the production was invested in by a commercial television house rather than one—hypothetically at any rate—freed to invent by public subsidy) for it represents a standard of invention against which television production can be measured. The television screen allows for the presentation of two, not three, dimensions. A third dimension can only be suggested by proportion, scale, camera angle, and spatial relationships: long landscape shots, for example, “flatten out.” Further, on television, colors are themselves and do not blend easily, but transmit gravitating in the direction of primaries and secondaries; though television can manage luminescent pastels. This makes the medium ideally suited for two-dimensional visual works such as the water colors of Blake. 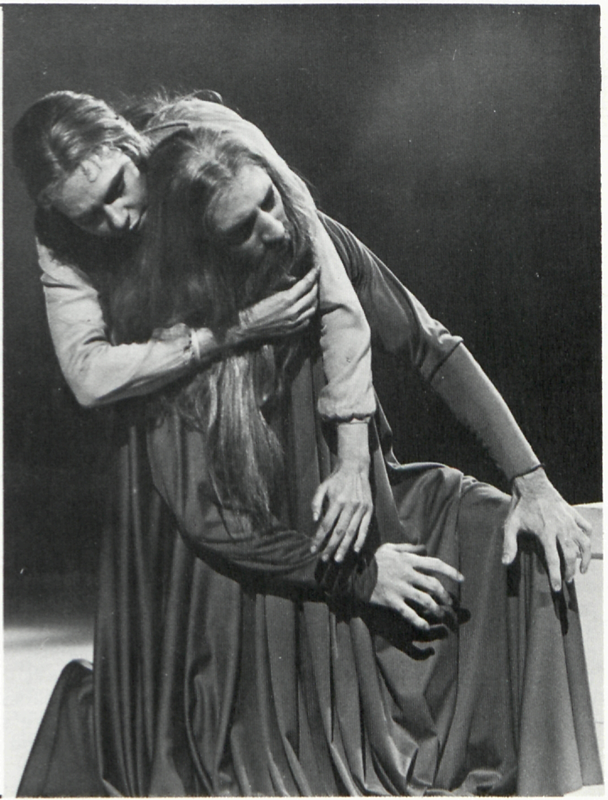 The ballet’s exploitation of these inherent characteristics of the medium is brilliant and operates at all levels of the production—in the treatment, choreography, performance, and post-production mixing of the final videotape. Thus, for example, using overlays of one video image upon another, coupled with effective lighting and the use of lasers, the television ballet creates a visually enriched heaven that is plausibly Blakean. At one moment a circle of angels choreographed for Blakean motion revolves around the throne of God transcending what a stage could allow and creating an environment that is fully mental and unrestricted by the bounds of space and time. At another moment, Satan is represented in fall or flight (the simultaneity of these two points of view being enhanced by the medium) against a backdrop of moving stars, so that he—as in Blakean representation—is simultaneously static and moving, undoubtedly in transition from one place to another, and yet between two places that are wholly out of nature. Unhappily none of the photographic stills of the performance provided by Thames Television to accompany this review exemplifies this, most crucial and most effective, aspect of the production. The intricate collaboration among the people responsible for the initial treatment, the choreography, the performance, and its realization on videotape is masterful. Similarly, the collaborators have achieved success with the use of color. For technical reasons having to do with greater success in coping with blue as a backdrop, primary use is made of the Butts set of water colors (as reproduced in the 1935 Morgan facsimile). Coloration, costume, backdrop, choreography, and Blake design have been carefully integrated to heighten the visual impact of the ballet, and the luminosity of the television screen assists a striking transference of Blake’s water colors into another medium. The angels and the sons and daughters of Job, for example, wear filmy Blakean gowns of yellow, green, blue, or red. Blake’s water colors are often quoted by the gestures of the dancers and, by crossfading, the water colors and the dancers sometimes coincide, the Blake water color fading into the screen to conclude a scene of danced action. For budgetary reasons the scenes in heaven are visually enriched more than the scenes on earth; and the production is thrown off balance by relying more heavily on Blake’s water colors to move the action on earth along than that in heaven. 2 JOB (Robert North), JOB’S WIFE (Siobahn Davies, and the three COMFORTERS. counterpoint between the painting and the ballet) only to conclude with the dancers freezing into a tableau and holding it for the predictable fade to the water color itself. What Blake made dynamic—a moment to be quoted by the dancers in passing—has become self-consciously posed. There are other moments in which the pictures are used more fluidly and effectively (Job and his Accusers, for example); and the illustrations themselves do not always appear when the ballet quotes them, but the overall effect is as I have described it in this instance. There are, I think, reasons for this rigidity which I shall suggest below. The second complaint about the production has to do with the generally conservative and conventional nature of television production. In television land, highly imaginative heavens inevitably suggest that conflation of romance and technology known as science fiction. Thus Blake’s enigmatic stony furniture in heaven, as designed for the sets in this ballet, is made to resemble a generalized futuristic design suggested, say, by the smooth slab that serves as a metaphoric motif in Kubrick’s 2001. Similarly, Satan’s descent through the heavens, striking as it is in simultaneously conveying stasis, motion, and transition, additionally carries the unfortunate trappings of the movement of a spaceship through intergalactic space as in conventional science fiction programming like Star Trek. 3 JOB (Robert North) with his WIFE (Siobahn Davies). The dancing is entirely effective and captivating. This is a highly skilled ensemble, fully capable of performing this difficult piece. 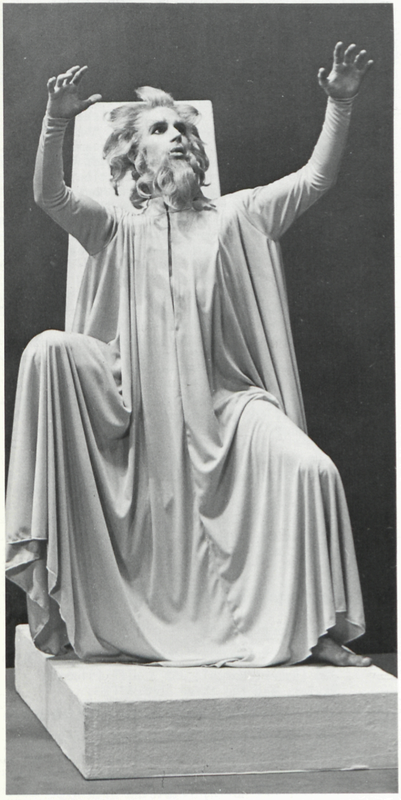 Of particular note is Namron, who performs the role of Satan—a demanding role, done with flawless articulation and skill. 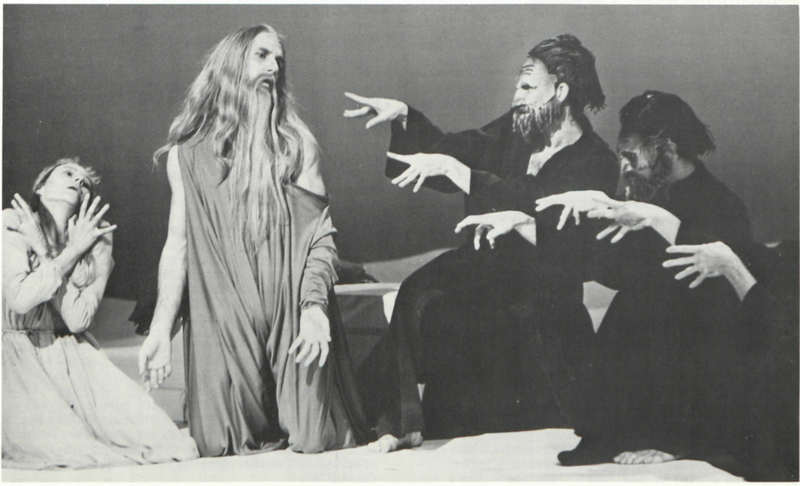 There has been some irritated response for having cast the only black dancer in the production as Satan. The reply has to be, of course, that he interprets the role magnificently and that no racial slur is implied. Still, the production might easily have clarified the racial ambiguities simply by integrating the casting of the sons and daughters and/or the comforters of Job. The second portion of the review is more problematic than the first; and its problematic nature is suggested by the lineage that results in this production. In the beginning there was Job. Then there were Blake’s illustrations of it, and then the scenario by Sir Geoffrey Keynes from which Ralph Vaughan Williams composed a score, out of which Dame Ninette de Valois created a ballet. The music is now used for a new treatment and a new choreography. To whom should a reviewer owe his allegiance if he does not want simply to bloom in a demonstration of the anxieties of influence? For purposes of the second portion of this review, I will place mine squarely with Blake on the grounds that no one involved in the conception of The Story of Job thought they were doing it without him. I do so with the insistence that it is possible to make a satisfying artistic experience unintentionally abusing or even deliberately misreading Blake. On its merits, this is a wonderful production. It is not Blake, though its producers would like it to be so. 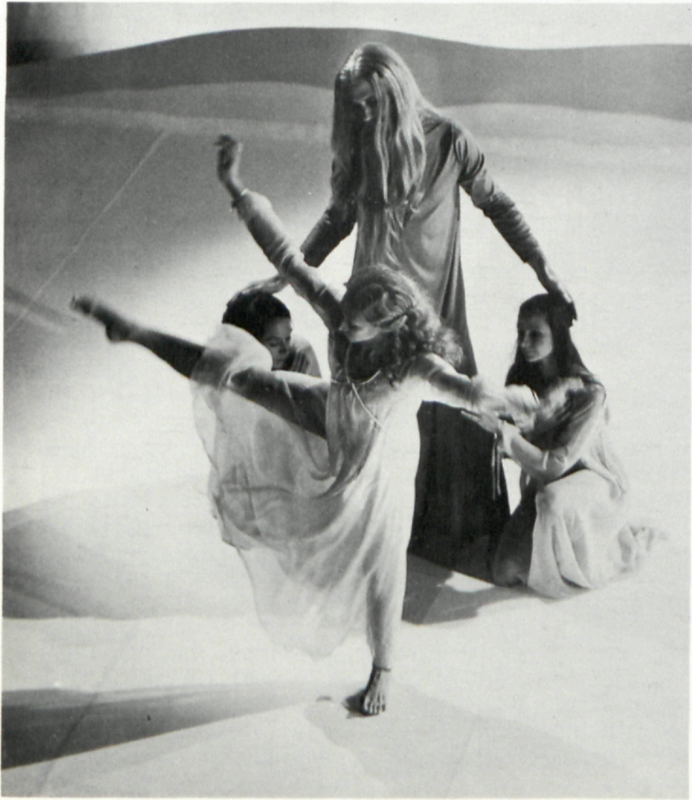 The ballet contains a narration (competently managed by Andrew Cruickshank) from the Authorized Version of the Bible, amounting to a plot synopsis, and implying that Blake is merely illustrating the well-known text. This ignores Blake’s own inscriptions on the engraved designs which quote the Bible from Genesis to Revelation and additionally provide invented “captions” of his own. Nor is this complaint easily dismissed as one made on behalf of Blake specialists petulant for being dispensible; for it is the main thrust of the designs that is bypassed in ways that some basic awareness of Blake’s work might well have precluded. Blake’s relationship to any text he illuminates is enigmatic and elliptical; seldom does he simply illustrate; and nowhere is this more true than in his intricate visual interpretation of The Book of Job—as the commentary by Keynes and Binyon in the Morgan facsimile might have indicated. The designs are variously mimed, quoted, and shown without much attention to what they mean because they are taken as illustrations rather than illuminations of Job; and this, I think, accounts for some of the woodenness mentioned earlier in the review. The ballet dutifully (and promisingly) begins and ends with the first and last of Blake’s illustrations—with the musical instruments hanging up in the tree in the first illustration and being played in the last. But the ballet has the performers dancing about with queer Blakean instruments in the concluding scene without knowing what to do with them other than to freeze in place for the final quotation, cross-mix, and fade. For the point has been missed—that Job has undergone a last judgment from a pious and dutiful reverence for his gifts to an energetic and creative use of them. The end of the ballet seems piously grateful for the hard time just got over; and we are still in need of the Blakean vision we ought just to have had to correct it. This is an error of interpretation that interferes with the entire ballet. The initial relationship between Job and his wife and between Job and his children is danced as far too affectionate and caring for the story Blake is telling. This provides an opportunity for some beautifully rendered ensemble and duet dancing, particularly by Job (Robert North) and his wife (Siobahn Davies), but it is not Blake. In Blake’s designs, Job and his God are reflections of each other, and this feature is somewhat enhanced by having both characters interpreted by the same dancer, Robert North. North sustains both roles with eloquence and skill; but the roles, makeup, hair style, and manner have been made different and so the point is lost. As Job, he is fluid, emotionally vigorous and appealing, and too young; while as God he is staccato, deliberate, and a bit harried, but not convincingly authoritative. 4 JOB (Robert North) rejoicing with his daughters after his new understanding of GOD. the sequence of the designs is altered. It is out of the fourteenth illustration (When the Morning Stars Sang Together) beautifully rendered that Satan’s descent emerges, thus losing the point of struggling to arrive at that epiphany. Further, Job’s Evil Dream (illustration 11) is moved considerably forward such that the sequence of Job’s torments emerge out of his dream, rather than Blake’s way, that among Job’s torments—and perhaps the most decisive of them—is his apocalyptic dream. Thus the ballet conveys the uneasy implication that all that occurs to Job is “only” a dream, albeit a moving and prophetic one. It must be added, however, that within the context of the dream, the sequence of devastations is eloquently rendered, as is the interaction between Job and his Comforters, including Elihu (Ross McKim)—these last being rendered in a Blakean way. There is no reason why the production of a ballet cannot rework Blake’s visual materials to its own ends. But for what purpose? to what end? In this instance I infer that the producers had not intended to do so; and that a production which moved me and which I liked might have been more moving yet had it adhered to what it tried to convey in a centrifugal rather than centripetal manner. In the form we have it, the production loses an imaginative center and focus. I close with a lament that while an English audience has had an opportunity to view the production, no such prospect seems imminent for American television audiences. The approximate cost for securing rights to American broadcast is estimated at $16,000—not much as these things go—but initial reactions from American public television are discouraging.